Here is a very easy recipe for a coffee and walnut cake. It’s almost a “one bowl” cake – you only need to add the coffee and walnuts to the basic mix at the end. Cook as two layers and fill and ice with buttercream as I did, or make one larger cake, or you could even make twelve cupcakes! It’s such a versatile recipe. Preheat the oven to 170 degrees C. Generously butter two 18cm (7″) cake tins. Put all the ingredients except the milk, coffee and walnuts into an electric mixer and mix until smooth and well incorporated. Dissolve the instant coffee into the milk, and add together with the chopped walnuts into the mixture. Divide the batter equally between the two tins. Place the tins in the oven and bake for 25- 30 minutes or until the cakes are cooked and golden on top, and a skewer inserted in the centre comes out clean. Remove from the oven, leave in the tins for 5 minutes before carefully turning out of the tins to cool on a wire rack. In a food processor, cream together the butter and icing sugar until light an fluffy. Dissolve the instant coffee into the milk. Add this mixture to the icing, process until light and creamy. When cakes are completely cool, spread half of the buttercream icing on the bottom layer, and top with the second layer. Roughly ice the top and sides of the cake with the rest of the buttercream using a palette knife. When you get to the sides, occasionally dip the palette knife into cold water as you ice to remove some of the thicker icing and to create the “naked icing” effect. The idea is that the top of the cake is well iced and that the side sides are stripped back for a rustic look. I’m still mastering the naked icing effect! Place the reserved walnuts on the top of the cake for decoration, or add a flower or two. Posted in Cakes, Sweet Food and tagged afternoon tea, buttercream, frosting, layer cake, naked icing, one bowl cake. Bookmark the permalink. Melting moments – lovely shortbread style cookies filled with buttercream, jam, passionfruit, really whatever sits comfortably between two biscuits! I made a couple of batches recently. I was experimenting with the technique of striping colour into the biscuit, by painting food colour into the piping bag before filling it with cookie mixture, an idea inspired by an episode of The Great British Bakeoff. I made raspberry jam and vanilla buttercream melting moments and melting moments sandwiched with passionfruit buttercream. For the raspberry ones, I used red food colour for the stripe, for the passionfruit ones, I mixed yellow and red food colour to make orange. Yellow on its own didn’t stand out as a colour. The technique for both is the same: simply paint a stripe using a pastry brush down the side of the piping bag, add your mixture, and pipe. I used a small star shaped nozzle. For raspberry melting moments, you need enough raspberry jam to fill 8-10 melting moments and 1 quantity of buttercream plus some vanilla extract. For passionfruit melting moments, you need the juice from 2-3 passionfruit, strained. Preheat the oven to 140 degrees C. For each batch, line 2 baking trays with baking paper. Put the butter, icing sugar and vanilla in the bowl of an electric mixer and beat until well creamed. Add flour and cornflour and mix until the flours are incorporated. Alternatively, you could use a food processor. I have used both – purists would say the electric mixture creams butter and sugar better. Place the dough into the piping bag prepared with your colour. Pipe small shapes onto the baking sheets, allowing room for spreading. Place in the oven and bake for 25-30 minutes, or until the biscuits are a light golden colour and slightly firm, swapping trays half way through the baking. Remove from the oven, and after 10 minutes, put the biscuits onto a wire rack to cool. To make the buttercream icing, cream the butter and icing sugar in an electric mixer or food processor until light and fluffy. Add a dash of vanilla extract for the raspberry melting moments. Add the strained pasionfruit juice for the passionfruit melting moments. To assemble the raspberry melting moments, spread one melting moment with raspberry jam and pipe buttercream on top. Sandwich with another melting moment. To assemble the passionfruit melting moments, pipe one melting moment with passionfruit buttercream, and sandwich with another biscuit. Posted in Biscuits and Slices, Dessert, Small Baked Things, Sweet Food and tagged buttercream, filled cookies, passionfruit, piping, shortbread. Bookmark the permalink. 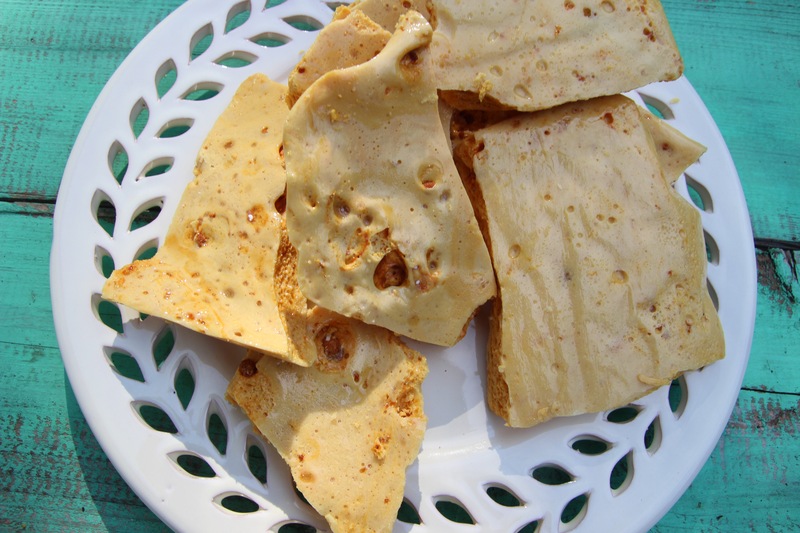 Here is a recipe I have revisited from January 2015. 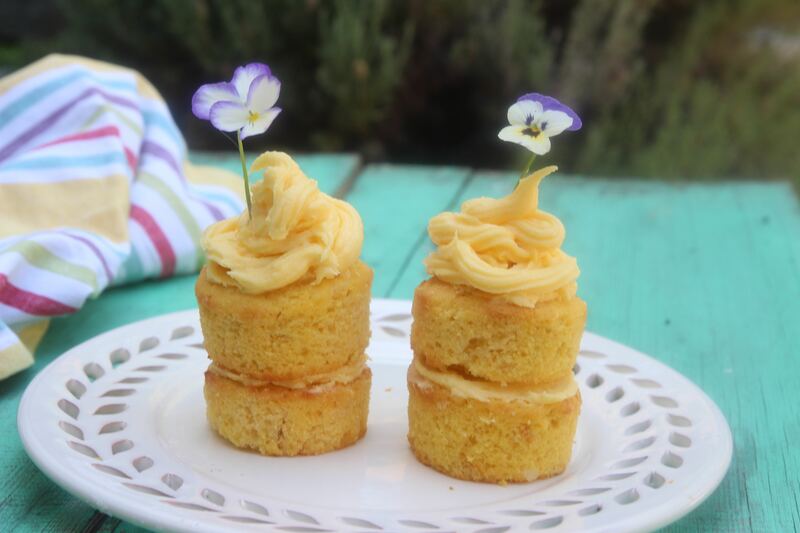 Little lemon cakes, tiered here for dramatic effect. It’s a basic cupcake mixture, a one bowl recipe. 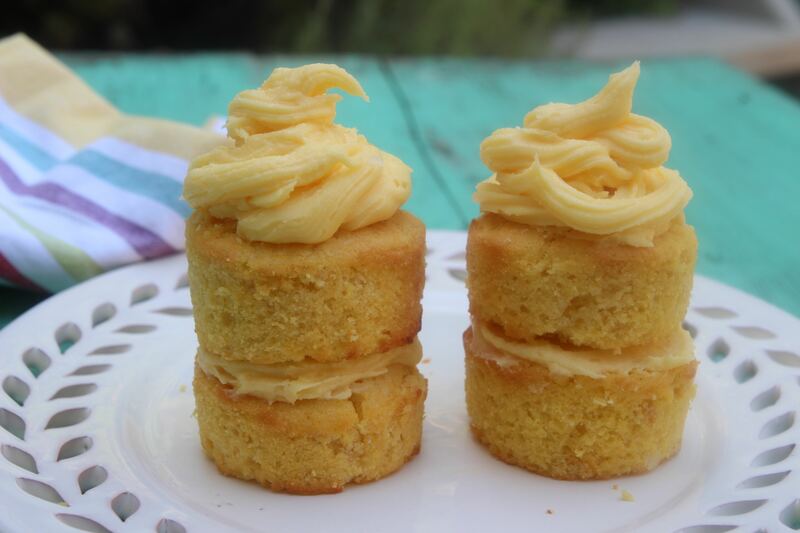 The lemon cupcakes are made with a whole lemon.Cooking a whole lemon, whizzing it, and adding it to the mixture, elevates an ordinary cupcake mixture to new heights, making a really tangy cake. I iced them with a simple buttercream icing. You can flavour it any way, I added passionfruit essence as I wanted a bright yellow icing and a little tang. Plain old yellow food colouring would be fine too. 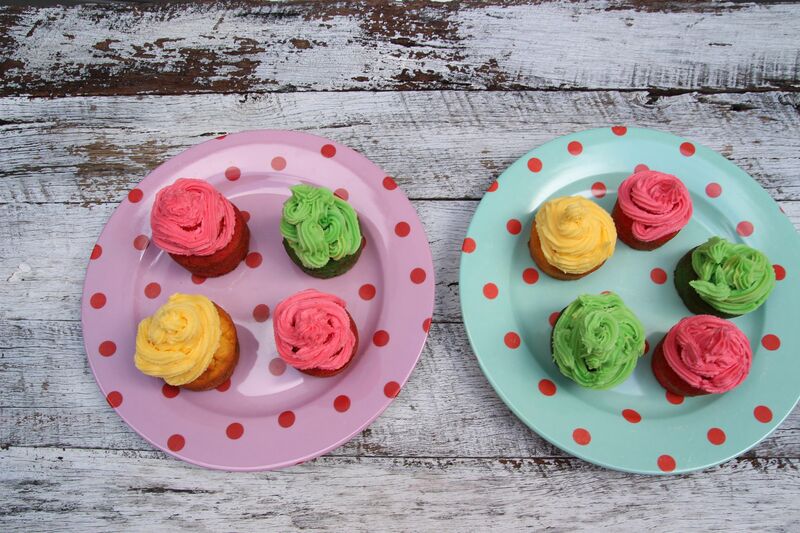 Preheat the oven to 180 degrees C or 160 degrees C fanforced and line a muffin or cupcake tin with cupcake cases. Put the lemon whole into a small saucepan, covering with water, bring to the boil and simmer for about 1/2 hour until the lemon has softened. Remove from the saucepan and cool. Cut off the ends of the lemon, cut in half and remove the pips. Put the lemon into the food processor and blitz – don’t pulverize, you still want a little texture. Add the rest of the ingredients to the food processor except the milk and food colouring and blitz till smooth. Add the milk while pulsing to make a soft, dropping consistency. Spoon the mixture into the cases. Place the tin in the oven and bake for 12-15 minutes or until the cup cakes are cooked and a skewer inserted in the centre comes out clean. 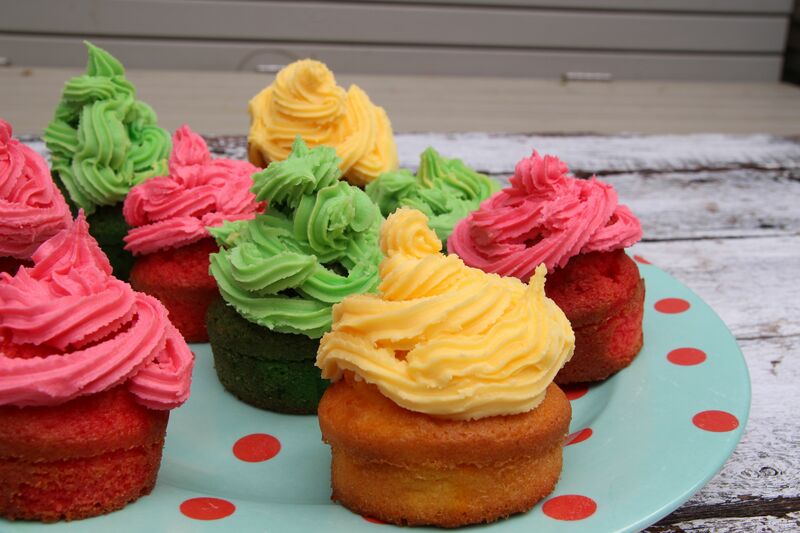 Take the cup cakes in their cases out of the tin and cool on a wire rack. Remove the cases ready for icing. Ice with the buttercream icing. In the food processor, cream together the butter and icing sugar until light and fluffy, then add flavour essence and/or food colour, whizzing continuously. You can either sandwich together two cakes for the tired effect or serve individually. If you are tiering, you may need to trim the bottom cake to allow the top one to sit straight. You can decorate with whatever you please. I candied some lemon slices and also used edible pansies, which are so pretty on cakes! Posted in Cakes, Dessert, Small Baked Things and tagged afternoon tea, buttercream, whole lemon. Bookmark the permalink. This my new favourite chocolate cake recipe again! I love it because it is SO simple – one bowl in the food processor or a stand mixer. I posted a fancy version with layers and meringue buttercream recently. This time it’s a more basic version suitable for crowds. On this Queen’s Birthday weekend in June, I’m cooking for a crowd. So I’ve made the basic recipe in a big cake tin and a half size in a smaller tin, to accommodate kids and adults at our gathering. 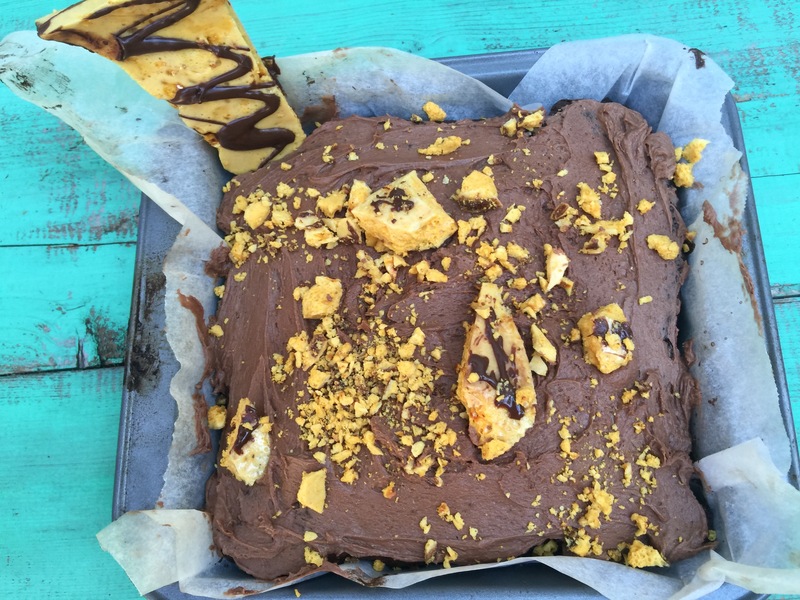 A chocolate buttercream icing and some home-made honeycomb – bliss! I’m including both quantities in Ingredients. The Method is the same for both cakes – just throw it all in and mix! *It’s hard to halve 3 eggs – putting 2 eggs in this cake just adds to the moisture of the cake. Preheat the oven to 160 degrees C. Grease a 23cm (9″) x 34cm (13″) rectangular cake tin and a 20cm (8″) square cake tin with butter and line with baking paper. Put all the ingredients in a food processor and blitz until just combined and the mix is smooth. Be careful not to overmix as this will toughen the cake. Pour the batter into the prepared cake tins and smooth the tops. Bake for 1 hour or less – until a skewer inserted into the centre of the cakes comes out clean. Keep both cakes in their tins until they are cool. Carefully turn out on to a wire rack. Or you can leave in the tins as I did to make it easier to transport the cakes. Put all the ingredients into a stand mixer and beat, first on low, then gradually increase the speed, beating until all the ingredients have amalgamated and the mixture has that “buttercream” consistency. Combine sugar, honey, glucose and 60 mls water in a saucepan. Cook till pale blonde – 150 degrees C, using a cooking thermometer. Remove from the heat, add bi-carbonate soda and beat vigorously for a few seconds. Pour onto a tray lined with baking paper. 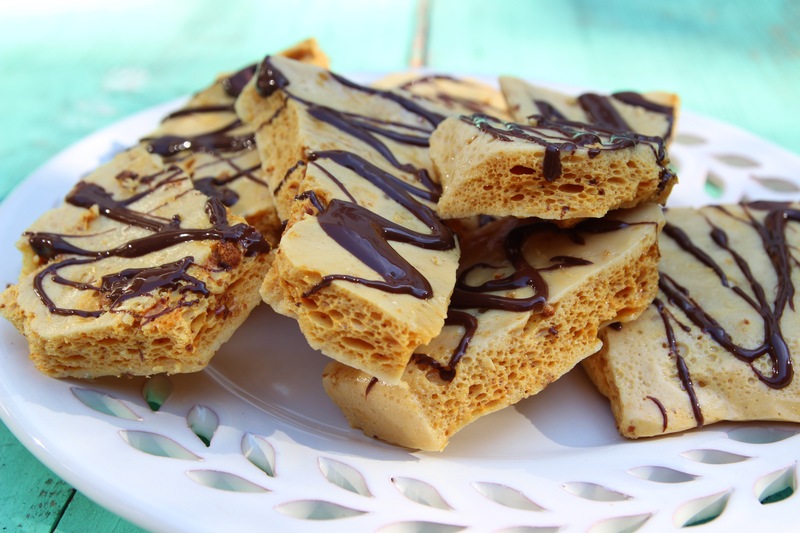 When the honeycomb has hardened, drizzle with melted dark chocolate and break some into chunks and pulverize the rest. 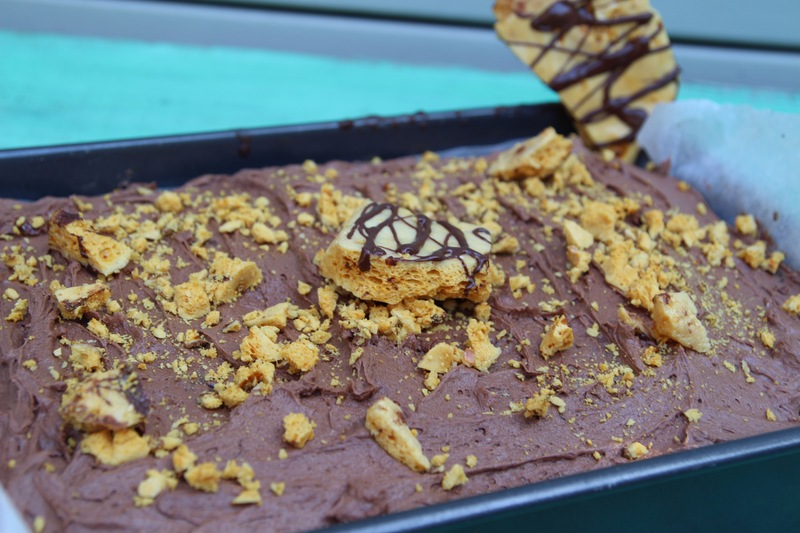 Ice the cakes with the buttercream frosting and decorate with chunks and pulverized bits of honeycomb. Posted in Cakes, Sweet Food and tagged buttercream, Dutch cocoa, honeycomb, one bowl cake mix. Bookmark the permalink. I have been making lots of little cakes after Christmas as an antidote to Christmas cake and Christmas pudding. I have taken my basic cupcake mixture, which is a one bowl recipe, and added different flavours. I’ll be posting some more variations soon. 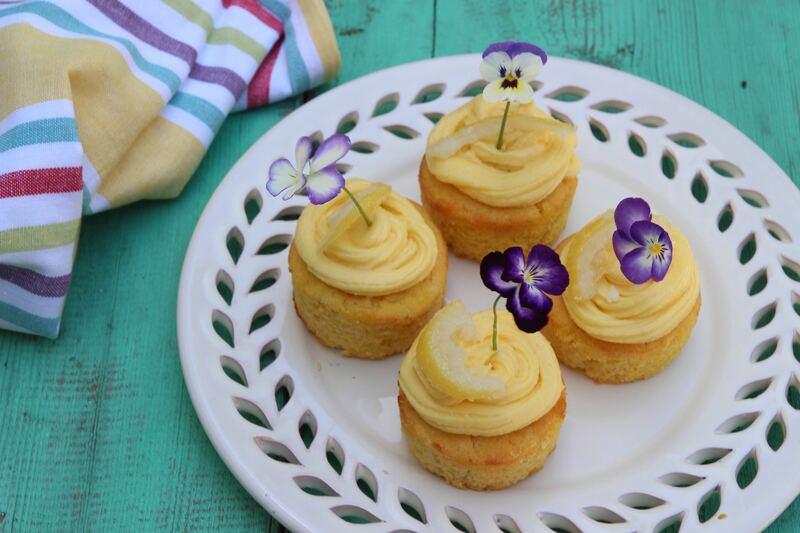 The lemon cupcakes are made with a whole lemon. They can be served individually or tiered, whatever takes your fancy. Cooking a whole lemon, whizzing it, and adding it to the mixture, elevates an ordinary cupcake mixture to new heights, making a really tangy cake. I iced them with a simple buttercream icing. You can flavour it any way, I added passionfruit essence as I wanted a bright yellow icing and a little tang. Plain old yellow food colouring would be fine too. Posted in Cakes, Small Baked Things, Sweet Food and tagged buttercream, cupcakes, lemons, pansies, tiered cakes. Bookmark the permalink. 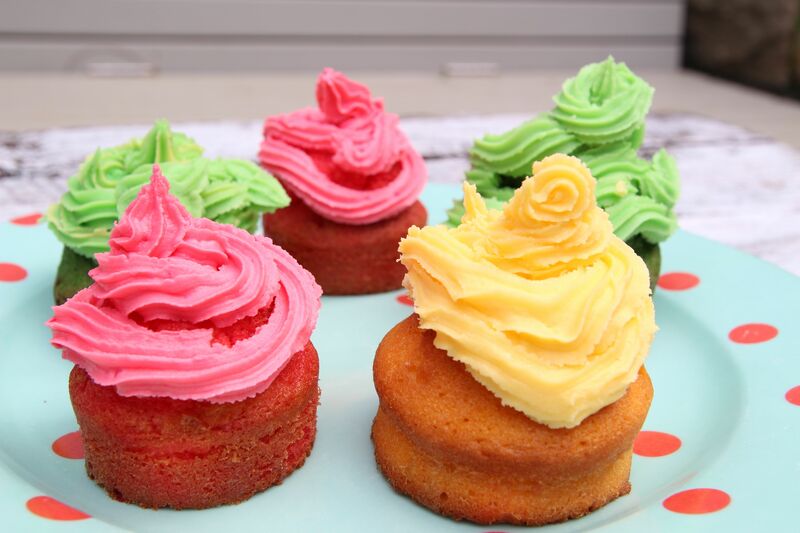 I have been experimenting with flavour essences for cupcakes as well as food colours, creating some pretty heady colours as well as flavours! I have created these for various young tasters but older tasters seem to like them too! Raspberry, passionfruit and lime are flavourful and vibrant. The raspberry cakes are the most successful, I think. The lime cakes taste a little artificial. The recipe is Nigella’s standard cupcake recipe, which I use a lot, as it’s an “everything in the food processor” recipe. The frosting is buttercream. Adding flavoured fondant creme is not strictly necessary, but adds more depth. Preheat the oven to 180 degrees C and line a muffin tin with cupcake cases. Put all the ingredients except the milk and food colouring in a food processor and blitz till smooth. Add the milk while pulsing to make a soft, dropping consistency. Divide the mixture into 3 bowls and beat in food colouring to each bowl. Place the tin in the oven and bake for 12-15 minutes or until the cup cakes are cooked and golden on top. In the food processor, cream together the butter and icing sugar until light an fluffy, then add flavour essence, food colour and fondant if using, whizzing continuously. Posted in Cakes, Dessert, Small Baked Things, Sweet Food and tagged buttercream, cupcakes, fondant, lime, Nigella Lawson, passionfruit, raspberry. Bookmark the permalink.